Which materials would work best with this coating or the spray finish that goes over it? Which ones are easiest to manipulate on this surface? How will the protective acrylic spray react with the decorative materials? A handy dandy test sheet helped answer some of those and a little nosing around online helped with others. One unexpected helpful result of the wavy, lumpy, holey nature of the sheet is that it was a demanding test of how the materials would handle. The curved sides of bowls would be a walk in the park after this surface. Once the black papier maché finish was painted on the test sheet and dried, I tried drawing on it with colored pencil, oil pastel, pastel and chalk. As you can see in the photo, the colored pencil was lighter and made a thinner line. It was fairly easy to control, but being so thin meant that a bump in the surface could accidentally throw the line way off. And it would be difficult to correct. The chalk was easy to apply and had a nice, thick (almost too thick, proportionately, for a small bowl) easily visible line. But, it brushes off like the dust it is and is a bit tough to control. 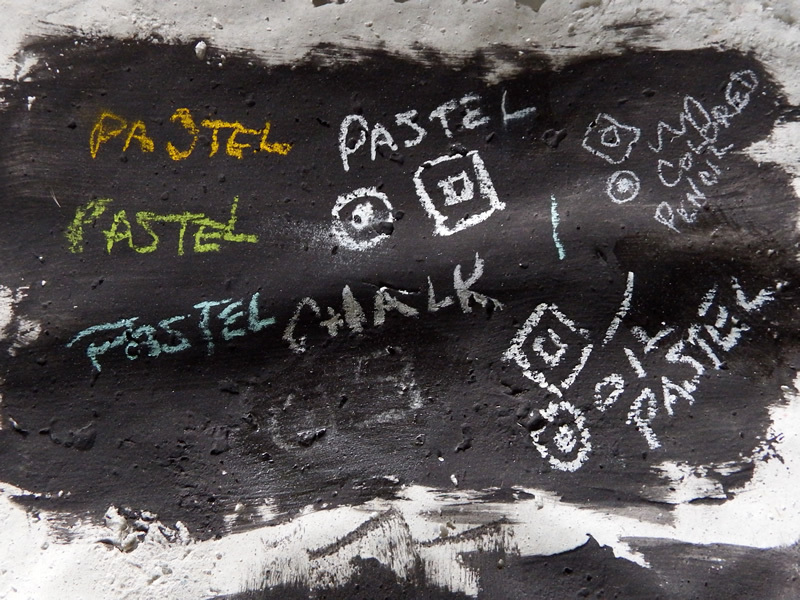 The pastel applied more smoothly than the chalk, but also has the tendency to smudge easily. It has more stick-to-it-iveness than chalk, but not enough. A fixative, like you’d use for charcoal or pastel drawing might make it more workable. This was the easiest to work with. It shows up strongly, doesn’t smudge easily and lets you control it well as you draw. Its most serious drawback is that its probably not the best idea to spray a protective coat on it. Researching it, I found out that it never completely dries. So covering it with a finish coat could lead to peeling or bubbling away from the bowl’s surface in the future. Dang! Some of the questions have been at least partially answered, but until I find the right material to make the marks, the spray finish reactions will remain a mystery.